We are the Leading Trader,Supplier and Wholesaler for Anarkali Ladies Wear Suits in Chennai,Tamilnadu,India. We are the Leading Manufacturer,Supplier and Exporter of Anarkali Salwar Kameez in Chennai,Tamilnadu,India. Our offered suits are designed using fine fabric that is procured from the most reliable and reputed vendors of industry. The entire ranges of meticulously designed suits are provided with traditional and timeless elegance. We offer these suits to our valuable clients at rock-bottom prices. 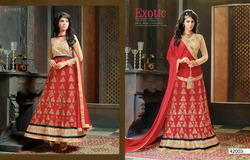 Weare the Leading Manufacturer,Supplier and Exporter of ExclusiveAnarkali Salwar Kameez. Our offered salwar kameez is widely demanded among women & girls for wearing on party or any other occasions. It is stitched & designed from the soft & finest fabric, our salwar kameez add gleam to the wearer’s personality and enhance their appearance. Its amazing embroidery work makes our range more attractive & different from others. We are giving this range at the reasonable rates. We are the Leading Manufacturer, Supplier, Wholesaler,Trader and Exporter of Fancy Anarkali Suits. Our offered suits can be worn casually by ladies with any dress to look more charming. These suits are designed using excellent quality fabric under the guidance of skilled professionals in compliance with latest market trends. We offer these suits in different colors and patterns keeping in mind varied needs of the clients. We are the Leading Manufacturer,Supplier and Exporter of Stylish Salwar Kameez. The offered anarkali suits are precisely designed with the help of premium quality fabric and advanced machines in compliance to set industrial norms. Our offered suits are provided with alluring designs and multiple color options. We provide these suits to our valuable clients at market leading prices. we are the leading manufacture,supplier and exporter Anarkali Chuudidhar. The offered range is designed using high grade fabric and advance technology in compliance with set industrial standards and norms. Our beautifully designed suits are available in various sizes and patterns. The entire range of suits is available in different styles, patterns and colors. Moreover, our products provide elegant appearance with any attire worn by the wearer. We are actively engaged in offering a wide array of Anarkali Chudidhar. The offered range is designed using high grade fabric and advance technology in compliance with set industrial standards and norms. Our beautifully designed suits are available in various sizes and patterns. The entire range of suits is available in different styles, patterns and colors. Moreover, our products provide elegant appearance with any attire worn by the wearer. We are the Leading Trader,Supplier and Wholesaler for Anarkali Ladies Suits in Chennai,Tamilnadu,India. We are the Leading Trader,Supplier and Wholesaler for Anarkali Suits in Chennai,Tamilnadu,India. We are the Leading Trader,Supplier and Wholesaler for Anarkali Semi-stitched Salwar Suits in Chennai,Tamilnadu,India. We take a great pleasure in the industry by offering our clients best and most beautiful collection of Anarkali Suit For Women. These suits are beautiful and look fantastic. They are designed in line with latest market trends. These suits are available in many sizes and textures. We are the Leading Manufacturer,Supplier and Exporter of Readymade Designer Georgette Embroidered in Chennai,Tamilnadu,India. Looking for Anarkali Salwar Kameez ?